Two tourists visiting the northern Italian city of Cremona over the weekend have broken a historic sculpture in their efforts to photograph themselves in front of it. 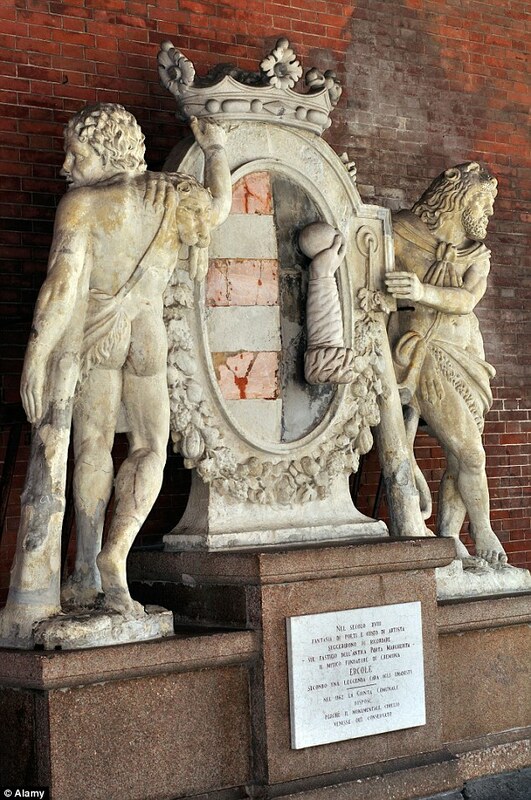 They were trying to climb the ancient artwork, “Statue of the Two Hercules“, when part of the crown fell and smashed. The marble sculpture is of the city’s coat of arms held by two figures of Hercules. Dating from 1700, it originally was displayed symbolically on top of one of the gates to the city as a homage to Hercules, who is said to have founded Cremona. In the early 1960s the sculpture was moved under the portico of La Loggia die Militi in the centre of the city. Although the perpetrators have been identified, it is not clear whether the Italian authorities will pursue charges. This is not the first time that precious Italian art has become the victim of clumsy tourists. In March last year a student broke a 19th-century cast of The Drunken Satyr at Milan’s Academy of Fine Arts of Brera when he tried to sit on its lap for a photograph. Curators have been fighting a losing battle against the scourge of the selfie (The National Gallery was one of the last to relent). This latest incident will no doubt add fuel to the debate about whether photography should be allowed in museums at all.